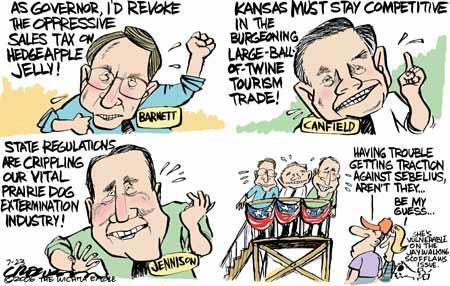 Canfield, of Overland Park, questioned Barnett’s support earlier in his legislative career for a tax increase. Barnett asked Jennison to explain his support of expanded casinos, and Canfield asked Jennison why he supported embryonic stem cell research. Barnett and Canfield said they opposed both expansion of gambling and embryonic stem cell research. Barnett also questioned Canfield’s $1 billion bond proposal to provide venture capital, saying that would deepen the state’s debt. Canfield said those funds would be raised privately, although when he rolled out the proposal, he had said it would be a combination of private and public funds. So Jennison is looking for some sort of appointment from the winner, and the attempts by the other candidates to distinguish themselves hinge on taxes, science and gambling. Bear in mind that in recent years, the legislature has only considered two ways of raising funds: taxes or increased gambling. Other ways exist, but most require some sort of investment, which means raising money. And if you oppose raising taxes or increasing gambling, you're opposing any sort of response to rising educational costs, increasing costs from Medicaid, road maintenance, or any response to unexpected disasters or opportunities.